On the 11th of November let’s create a modern ritual, a post-millennial cultural cult. Eleven hours on the eleven bus — join us. 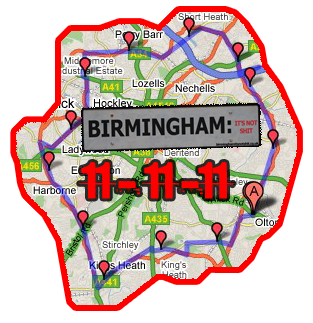 Get on the 11C at 11am (or as near as dammit) on 11/11. Get off the 11C at 10pm — 11 hours later — (or as near as dammit) on 11/11. You can get on and off the bus as many times as you like (don’t spend more than an hour off bus). A post-cultural, post-sporting, post-everything pyschogeographical document of the city. The clockwise circling will create a centripetal force for good. On the TWM site, or as a video. This is kind of inspired by Gimpo’s 25 Hour M25 spin. and the explanation for a clockwise journey (as distinct from anti-clockwise, either, or both) is…? I kinda like the idea of a pendular movement between SE and SW, or even something complicated involving 3(2xCW-.67xACW). Clockwise, because I’ve done an 11A circuit before. You can , of course, do what you like. But this one is circular, a sort of Walls of Jericho thing I guess. Oh wonderful, this is so great. All the best things have been happening in Birmingham since I left, damnit! I am partly thinking about the potential for duplication of effort. Not that it matters much. If 16 people get on at Kings Heath, so be it. Then it just becomes a moving lounge party. But I’ll be on the bus going the other way and will try to photograph it in passing. Hopefully someone will decorate the upper windows to make it that much more festive. Might be a bit of a problem with the memorial services happening on that day – I’ll certainly be observing the silence at 11am and I invite you all to do the same. Sam, I’m not forcing anyone to do anything. There will be no effect on any memorial services, unless a vicar decides he must be on the 11C instead of conducting one. Anyone is welcome to join “as near as dammit” (where dammit is your own interpretation) to 11am as in the rules. …of course, this opens the possibility of the 11 route pub crawl. 11 evenly spaced pubs in 11 hours? Sounds do-able to me. Now to find 11 (decent) pubs as near to the route as possible. Thinking about it though – you’ve missed a trick. You could have done the same for the 8 route next Friday – 08/08/08. >Thinking about it though – you’ve missed a trick. You could have done the same for the 8 route next Friday – 08/08/08. For some reason the 8 route just doesn’t hold the same significance for me, maybe because it doesn’t circumnavigate the city, although I’d be pleased to hear of someone organising such a thing. This is inspired. This is genius. This could end in tears but my camera will be cleaned, my pens and notebook will be out and my hair will be slicked back ready to go on the bus with the wheels that go round and round. The OSM map of the 11 route is complete but many of the bus stops are not there yet. Link below gets you there. Zoom right in on the A4040 to see the bus stops already present. Nice idea, Andy – I’ve popped a request up on the elevenbus.co.uk site. I think I’ll be to busy on the day, but someone might take up the cudgels.